The Princeton Review GRE course stacks up well against the competition with various in-person, live online and self-paced options. 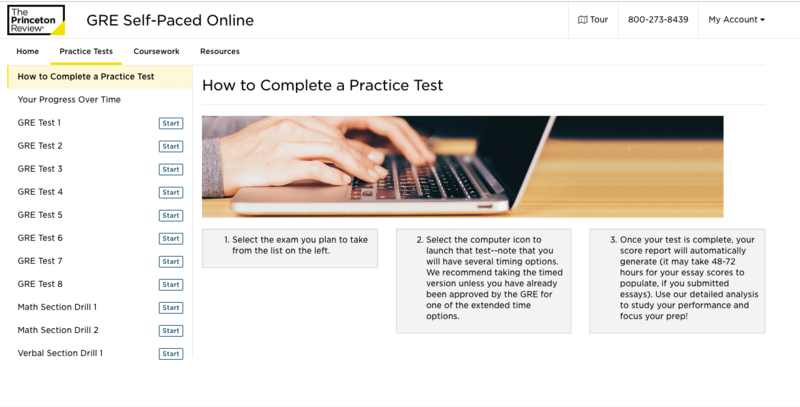 Students can customize the level of help they need by choosing from three different levels of tutors (private, master, and premier level) and prepare for the actual GRE by trying their hand at 8 full-length, computer adaptive practice exams. They offer A LOT, and honestly, I love their resources more than most. The Princeton Review’s Adaptology™ teaching method makes sure that each program is tailored specifically to each student’s needs, and all live courses include one-on-one practice test reviews with your instructor. The GRE is a test that responds and reacts to each student’s performance, and it is fitting that prep courses function the same way. This article will take you through the key features of the Princeton Review program, including the positive and negative aspects and the features that make it unique among the pack. With 8 full-length, section-adaptive computer practice tests, The Princeton Review is ahead of the game when it comes to simulated practice. After each test, students receive personalized feedback to identify areas of strength and weakness, so they can focus their study efforts to maximize their score. Students who are new to the GRE might be thrown off balance by an exam that changes its difficulty level in response to their performance. Seeing questions that you feel are easier can have a detrimental psychological impact, and it can be generally confusing when you feel that difficulty levels are escalating. More than most other types of exams, the more exposure students have to this unique mechanic, the more comfortable they will be at test time. 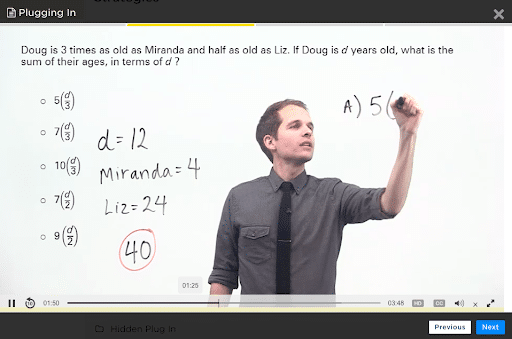 The Princeton Review online materials utilize their trademarked DrillSmart technology, which features adaptive questions based on your performance. Each drill session begins with a calibration question, which will dictate the difficulty level of the ensuing drill. This simulates the ever-changing nature of the GRE itself, and will help students be more comfortable with this unique test feature. For those who can’t afford a private tutor, Princeton Review offers the Semi-Private Course, which is capped at a maximum of 4 students. This is a great way to get a lot of personal help from an instructor in an in-person or live online setting. The course takes place either once or twice a week for a total of 24 in-class hours in addition to all of the online materials. The Princeton Review is the only self-paced GRE course we reviewed that offers essay feedback. 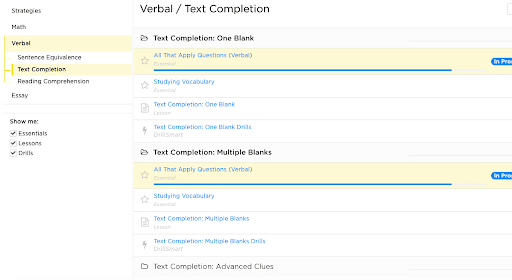 You can submit your essays through the LiveGrader tool, and one of their experts will score your essay and give you suggestions on how to hone your essay-writing skills for a higher score on the exam. This can make the critical difference when it comes to the actual exam. It is difficult to ditch bad writing habits, and having a responsive grader reviewing your writing and providing personalized feedback is critical. With other practice exams–if there is no one giving feedback–negative habits can actually be reinforced through practice, rather than corrected. 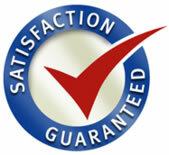 Princeton Review offers three different types of guarantees, the Readiness Guarantee, the Satisfaction Guarantee, and the Money Back-Guarantee, to keep their clients happy. If you do not feel ready to take the test at the end of a course, you can repeat the same course or take a refresher course (if available). If you are not satisfied with your result (regardless of the score you receive) you can continue to work with The Princeton Review for up to a year. Finally, if your score doesn’t improve after completing their program, you can ask for a tuition refund. Please see The Princeton Review website for additional details concerning their guarantees. Students who sign up for the Ultimate course will also have access to their instructor outside of class hours, either in person, by phone, or by email. If you choose the private tutoring option, you can customize the price based on the expertise and experience of your tutor. Private Level Tutors have more than 40 hours of intensive training and extensive instruction time, Master Level Tutors have more than 500 hours of tutoring or relevant work experience and have helped clients achieve superior score improvements, and Premier Level Tutors have at least 1,000 hours of tutoring or relevant work experience and have achieved exceptional results for their students. This is an especially useful feature, as private tutoring tends to run as the most expensive option for most prep courses, but it also can pay huge dividends for student performance. Being able to choose the right tutor to make this option properly affordable is a huge plus. Several other GRE Prep courses have question banks that allow you to create quizzes and focus on specific areas by filtering questions. The Princeton Review has numerous full-length exams (including one free practice test) that can help you identify areas of weakness and 3,500+ practice questions, but there is no quiz bank of questions. Custom-designed flashcards are available, but there is no mobile app. Students will have to look elsewhere if they want to get in some study time on their smartphones or tablets while they are commuting or have a few minutes to spare. With just a 4 month voucher, the Princeton Review offers the shortest length of online access among the top GRE prep courses. While the impact of this will depend largely on the availability and pacing of your own study schedule, it is important to keep in mind that you may be on a shorter timeline for utilizing the online materials than you might wish. Students looking for a quick review for the exam can benefit from the inexpensive Quick Study course, priced at just $149. This streamlined online course is accessible for 120 days and includes 2 practice tests, a smaller selection of questions and drills, and a diagnostic test. Students who need a more comprehensive reviews can choose from live and self-paced options, depending on their preferred learning style. One-on-one practice test reviews with an instructor are included in every live course option, and opportunities exist to connect with instructors outside of classroom time, which is ideal for students looking for more individual attention. Likewise, the Adaptology™ teaching method automatically tailors classwork and homework to each student’s skill level to focus on the areas that need the most improvement. Finally, the LiveGrader feature gives students feedback on their GRE practice essays, which many GRE prep courses either do not address at all or treat as an afterthought. The Princeton Review’s GRE prep courses deliver a number of personalized options. Students can choose from various levels of tutor expertise, enroll in a small-group learning experience, or take advantage of the flexible Self-Paced option, all at a reasonable price. The 8 full-length, computer-adaptive practice exams are a bonus, as no other prep course offers this many practice exams. Also included with the online materials is the Princeton Review College Planner, which is a personalized program that helps track down the school and program that matches your strengths. Although there is no free trial or mobile app, The Princeton Review has much to recommend it. TAKE ME TO PRINCETON REVIEW GRE! The self-paced course is for the student that is highly self-motivated and knows how they want to study already. 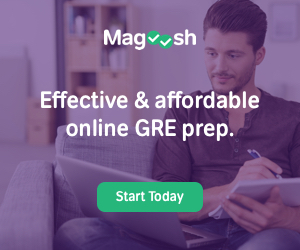 You won’t get the added benefit of live online classes, but you’ll get the basics to succeed on the GRE – assuming you are consistent and have a calculated personal study plan. Coursework is broken down by subject (quantitative, verbal, and writing). This allows you to follow along in their suggested order, or craft your own study plan to focus on the areas you feel need rehearsal. Furthermore, the courses include dynamic video lectures that feature real instructors walking you through the lessons. A virtual whiteboard feature helps you feel immersed in the material, as you can watch the instructor actively work out problems and diagram strategies in front of you. PRINCETON REVIEW’S SELF-PACED GRE COURSE! Includes: 24 hours of live instruction with expert Princeton Review instructors, 184 hours of online resources (includes 470+ drills, 3500+ practice questions, 24 hours of recorded videos lessons and 8 full-length, adaptive practice tests), one-on-one test reviews with your teacher, access to instructor outside of class hours (in person, by phone, or by email), Adaptology teaching method, and money-back guarantee. I recommend this course for anyone that doesn’t need in-person instruction but would like the expertise of Princeton Review instructors for 24 hours. It’s a great value. PRINCETON REVIEW’S LIVE ONLINE GRE COURSE! Princeton Review’s Ultimate In Person course is essentially the same as their Ultimate LiveOnline offering. The main difference is, with this course you’ll be in an actual classroom with the instructor, rather than an online, virtual classroom. Both courses are “live” with the instructors, but if you prefer to physically be at the classes, this is your best bet. PRINCETON REVIEW’S IN PERSON GRE COURSE! 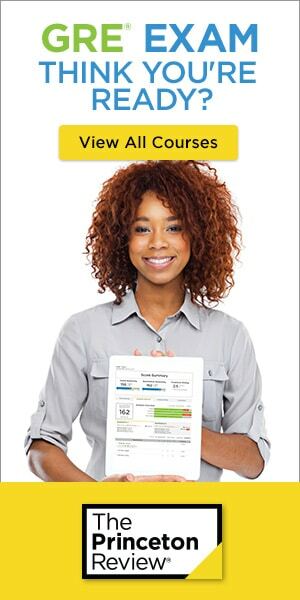 The Princeton Review’s tutoring program is available in two formats: in person and online. They match each student with an expert tutor who will help you make a detailed study plan, set goals and guide you throughout your entire study process. The private tutoring program comes with The Princeton Review Guarantee and the assurance that, if you’re not satisfied with your tutor after your first session, they’ll find you a new one that fits your needs. This makes them a top-tier tutoring option, where other GRE prep companies fall short in this category. Scheduling is simple; there are options to meet either one or two days week, with numerous combinations making it likely that you can find the pairing of days that works with your schedule. Now that we’ve gone in-depth with the Princeton Review, take a look at how it stacks up directly against other available options for GRE Prep. Remember that your personal learning style, available time, and future goals will dictate which course is right for you. Keep in mind your needs for personalized learning, mobile access, and the benefits of full-length adaptive practice exams when considering the Princeton Review for your GRE prep. Do you know how long the Princeton Review has been around? I like their review course style i’m just curious because it seems like i took one of their courses back in high school. Princeton review has been around since 1981. They are definitely one of the top test prep review companies.